The Election Commission of India has barred Samajwadi Party leader Azam Khan from campaigning for 72 hours while Union Minister Maneka Gandhi has been barred from election campaigning for 48 hours. The prohibition on Azam Khan and Maneka Gandhi begins at 10 am today. 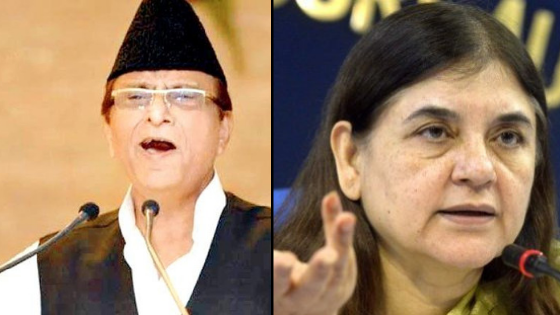 Taking note of their alleged controversial remarks, the Election Commission of India (ECI) on Monday (April 15) barred Samajwadi Party leader Azam Khan from campaigning for 72 hours while Union Minister Maneka Gandhi has been barred from election campaigning for 48 hours. The prohibition on Azam Khan and Maneka Gandhi begins at 10 am today, April 16. While addressing an election rally on Sunday, Azam Khan had made derogatory remarks against actor-turned-politician Jaya Prada, the BJP candidate from Rampur constituency. "I brought her (Jaya Prada) to Rampur. You are a witness that I did not allow anyone to touch her body. It took you 17 years to identify her real face but I got to know in 17 days that she wears khaki underwear," Khan had said while addressing an election rally in Rampur. Meanwhile, Union Minister Maneka Gandhi on April 12 had said in a public address in Sultanpur that her win from the Sultanpur Lok Sabha constituency was certain "with or without" the support of the Muslims and the community should realise it since they will need to get their work done once BJP is in power. "You have to recognise that this victory is sure without you and even with you, and you will have to spread the word," she said while addressing a rally in Sultanpur. Emphasising that she had distributed Rs 1,000 crore for Muslim institutions to flourish, she said, "You came to seek our help at the time of your need. But, if you say during election time that we will not vote for the BJP and instead vote for any other party which can defeat BJP, then it breaks our heart." "I have already passed this election. But now, if you have to lay the foundation for getting help then this is the right time to do so," Maneka Gandhi added, while indirectly calling upon the Muslim community to vote for her. Earlier on Monday, EC had a crackdown on Bahujan Samaj Party supremo Mayawati and Uttar Pradesh Chief Minister Yogi Adityanath from campaigning for 48 hours and 72 hours, respectively, for making speeches which allegedly violated the Model Code of Conduct.